Great photographers are made, not born, and even the best photographers have plenty of unimpressive shots in their collections. But in the age of digital photography, it’s possible to create a great photograph without being a great photographer. You can even accomplish this days after snapping your photo, so long as you have the right post-processing software and a little time to play around. 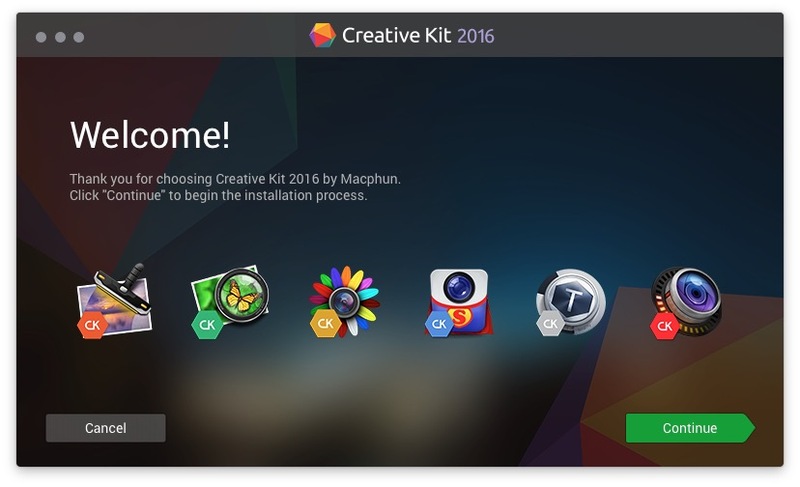 The six Creative Kit 2016 apps arrive as a single download with one installer. This is how the basic and Pro versions are regularly priced — bear in mind that Creative Kit 2016’s “CK” versions are all better than their “Pro” predecessors. Do the math and you’ll wind up with a cost of $88 just to get the basic versions of all six apps, versus $315 for all six Pro versions. Since you’re getting the Pro apps, Macphun’s Creative Kit 2016 price is less than half the cost of buying those six apps separately. If you’re thinking of buying just two or three Pro apps, Macphun is effectively encouraging you to grab the whole Creative Kit instead. And that’s frankly a pretty good idea. How do Creative Kit 2016’s Pro/CK versions differ from the basic ones? Each app varies, but they generally include plug-in support for Adobe and Apple photo editing apps, a collection of meaningfully better photo processing engines, batch processing capabilities, and some brand-new, CK-exclusive presets and filters. The point of Focus CK is simple: use post-processing software to mimic the depth-of-field effects offered by excellent lenses. Focus lets you choose an area of sharpness, then surrounds it with your choice of circular or linear bands of softness that create depth-of-field-like blurring. Presets enable you to quickly achieve appropriate “focus” for portrait, nature, architecture, macro, and tilt-shift photographs, while manual controls let you independently change the sharpness, brightness, and colors of blurred and focused areas. Beyond the speed and simplicity Focus CK offers, the power of its results — particularly tilt-shift-like blurs and saturation — is seriously striking, and masking tools give you pixel-level control over the effects if you want it. Macphun’s best-known app is also its most broadly-featured one: FX Photo Studio originated on iOS as a more powerful alternative to Instagram-style photo filters, and now possess an incredible array of over 200 filters and frames. The basic concept — use color-shifting, overlays, and underlays to make a simple photo “pop” — now has hundreds of possible permutations, injecting subtle or powerful colors and shapes into images. A single click on a preset is enough to make a dull image explode with improvements, while simple or full manual sliders let you fine-tune the effects. FX Photo Studio CK includes RAW support, as well. Intensify’s core functionality seems simpler than it is. Using presets (or your choice of manual histograms and sliders), it enables you to use colors and sharpening tools to reveal muted or hidden details in photographs — a great feature if you’re using a camera that produces sharp but flat-looking images. The results you’ll get from Intensify will depend on whether you’re trying to subtly enhance certain colors or really bring out buried elements in a picture, but the micro-sharpening, editing, and color adjustment tools go beyond what you’d find in basic photo editors such as OS X Photos. Macphun pitches Intensify as a way to recover the full dynamic range of photos lost when skies get blown out or shadows make things too murky, and it actually works. I’ve reviewed the standalone version of Noiseless in greater detail here, and it’s a truly great app: using your choice of a bunch of presets, you can instantly reduce grain and blocky noise in images, preserving much (if not most) of the original image’s sharpness at the same time. While I’ve seen some debate amongst serious photographers as to how the app’s noise reduction compares against standalone apps costing twice as much as the entire Creative Kit 2016 package, I’ve achieved excellent results with only a few minutes worth of tweaking even when I start with deliberately miserable-looking photos, such as the one above, which was severely underexposed and had tons of noise to eliminate. Noiseless is one of my most-used Macphun apps, and will likely be one of yours, too. I knew nothing about Snapheal before testing the Creative Kit 2016, but was amazed to see how well it worked for its single task: effortlessly erasing things from photos. Doing nothing more than using the cursor to highlight objects I wanted to remove, then hitting a large “erase” button, I watched as a doorknob disappeared perfectly — replaced by a regular length of door — then repeated the same trick to delete a plant in the background. Then I only had to tick one box (“local” rather than “global”) to near-perfectly remove panels from the door; I show the slightly imperfect (but easily corrected) result as “Quick Snapheal” above, then an rapidly improved version using a built-in cloning tool as “Better Snapheal.” Snapheal accomplishes each of its erasures by analyzing the area to be scrubbed against either the whole of the image or the area immediately around it, operating as a super-smart healing brush. Even as a fan of Photoshop’s healing and content-aware filling tools, I was impressed by how well Snapheal worked with minimal user intervention. Like Noiseless, I reviewed the standalone version of Tonality here, and found it to be an awesome tool: Tonality turns full-color images into astonishingly beautiful grayscale/black-and-white photos, or similarly limited-tone sepia, blue, or other variants. Once again, the app’s focus is deliberately circumscribed to do just one thing very well, letting you use a large collection of presets to choose the way you want your image to look. If you thought there was only one way to make a black-and-white photo, Tonality will quickly change your mind, as it creates highly stylized renditions that could as easily appear in old-time newspapers as in modern art collections. Creative Kit 2016: Is It Worthwhile? As much as I enjoy composing photos that look really great without any post-processing, I’ve learned to appreciate the extra value that photo editing tools can provide. The Creative Kit 2016 lets you re-visit old images, making them look better than they did when you took them. As a package, it strikes me as a superb value at its pre-order asking price: even individual tools can produce results that range from dreamy to hyper-detailed to subtle or punchy based on your preferences and mood. And when you use two or more tools together, you can produce even more amazing results — akin to the output of a more expensive camera — as demonstrated by the series below. I wanted to see whether I could use Creative Kit 2016 and an iPhone camera to replicate an image snapped with a $2,500 DSLR and $1,800 lens — with only 5 minutes of editing time. So I used both cameras to take roughly the same picture, then loaded Focus CK to replicate the DSLR’s depth-of-field. Using the app’s mask brush and eraser, I was able to easily draw atop the area I wanted to keep in focus, then use sliders to choose the amount of blurring, saturation, and blowing out of highlights I wanted to achieve for the background. Then, with only 1 minute to make level adjustments in Intensify CK (below), I was able to bring the iPhone image’s colors much closer to the DSLR’s originals. You can click on the full-sized images above to compare them. Having shot digital photographs for over 15 years (and used photo editing software for at least that long), the highest praise I can give Creative Kit is that the six tools here routinely achieve different and better results than premium photo apps I’ve relied upon, including Photoshop and Aperture. Whether you’re a decent photographer looking to become good, a good photographer hoping to become great, or a great photographer wanting to create something iconic, Creative Kit 2016 will certainly have something for your needs. It’s a great investment in your past, present, and future photography. Check out more of my How-To guides and reviews for 9to5Mac here! In recent months, I published a guide to turning your digital photos into beautiful wall art (see Part 1, Part 2, and Part 3), as well as a lot of different topics of interest to Mac, iPad, iPhone, iPod, Apple TV, and Apple Watch users.